Which Home Theater Receiver is Best For You? One home theater question that is asked often is if a 5.1 or 7.1 channel home theater receiver is better. It turns out that both options have advantages and disadvantages, depending on what source components you are using, how many speakers you want to use, and what your personal preferences are in terms of setup flexibility. A Center Channel to provide an anchor stage for dialog or music vocal. Left and Right Front channels to provide the main soundtrack information, or for stereo music reproduction. Left and Right surround channels for side and front to rear motion effects from movie soundtracks and ambient sounds from music recordings. The Subwoofer channel, which provides the extreme low-frequency effects, such as explosions or bass response in music performances. When trying to decide if a 5.1 or 7.1 channel home theater receiver is right for you, there are several practical features of a 7.1 channel receiver that could be of benefit that you may not have considered. More Channels: A 7.1 channel system incorporates all the elements of a 5.1 channel system, but instead of combining both surround and rear channel effects into two channels, a 7.1 system splits the surround and rear channel information into four channels. In other words, side sound effects and ambiance are directed to the left and right surround channels, and the rear sound effects and ambiance are directed to two additional rear or back channels. In this setup, the surround speakers are set to the side of the listening position and the rear or back channels are placed behind the listener. For a visual look at the difference between a 5.1 channel speaker layout and 7.1 channel speakers layout, check out an excellent diagram provided by Dolby Labs. The 7.1 channel listening environment can add more depth the surround sound experience, provide more a specific, directed, and spread-out sound-field, especially for larger rooms. Surround Sound Flexibility: Although most DVDs and Blu-ray Discs contain 5.1 soundtracks (as well as some that contain 6.1 channel soundtracks), there are an increasing amount of Blu-ray soundtracks that contain 7.1 channel information, whether it be 7.1 channel uncompressed PCM, Dolby TrueHD, or DTS-HD Master Audio. If you have a 7.1 channel receiver with audio input and processing capability via HDMI connections (not pass-through only connections), you can take advantage of some, or all those surround sound audio options. Check the specifications, or user manual, for each 7.1 channel receiver you may be considering for more specifics on its HDMI audio capabilities. Surround Sound Expansion: Even with playback of standard DVDs, if your DVD soundtrack only contains Dolby Digital or DTS 5.1 or, in some cases, DTS-ES 6.1 or Dolby Surround EX 6.1 soundtracks, you can expand the surround sound experience to 7.1 by using the Dolby Pro Logic IIx extension or other available 7.1 DSP (Digital Sound Processing) surround modes that may be available on your receiver. Also, these added modes can extract a 7.1 channel surround field from 2 channel source material enabling you to listen to CDs or other stereo sources in a fuller surround sound format. More Surround Sound Options: Other surround sound extensions that can utilize 7.1 channels are Dolby Pro Logic IIz and Audyssey DSX. However, instead of adding two surround back speakers, Dolby Pro Logic IIz and Audyssey DSX allow the addition of two front height speakers. This provides additional speaker setup flexibility. Also, Audyssey DSX also gives users the option, in a 7.1 channel setup to place a set speakers between the surround speakers and the front speakers, instead of height speakers—these speakers are referred to as "wide surround" speakers. Bi-Amping: Another option that is becoming more common on 7.1 channel receivers is Bi-Amping. If you have front channel Speakers that have separate speaker connections for the midrange/tweeters and the woofers (I am not referring to the subwoofer, but the woofers in your front speakers), some 7.1 channel receivers allow you can reassign the amplifiers running the 6th and 7th channels to your front channels. Then enables you to retain a full 5.1 channel setup, but still, add two additional channels of amplification to your front left and right speakers. Using the separate speakers' connections for the 6th and 7th channel on your bi-amp capable speakers, you can double the power delivered to your front left and right channels. Your front mid-range/tweeters end up running off of the main L/R channels and your front speaker's woofers running off your 6th and 7th channel Bi-amp connections. The procedure for this type of setup is explained and illustrated in the user manuals for many 7.1 channel receivers. However, as I mentioned earlier, although this is becoming a more common feature, but is not included in all 7.1 channel receivers. Zone 2: In addition to Bi-amping, many 7.1 channels home theater receivers offer a powered Zone 2 option. This feature allows users to run a traditional 5.1 channel home theater setup in your main room, but, in instead of bi-amping your front speakers, or adding two additional surround channels behind the listening position, you can can use the extra two channels to power speakers in another location (if you don't mind a set of long speaker wires). Also, if you like the idea of running a powered second zone, but still desire a full 7.1 channel surround sound setup in your main room, some 7.1 channel receivers can allow this, but you can't do both at the same time. In other words, if you turn on the 2nd Zone while you are using the main zone, the main zone automatically defaults to 5.1 channels. What this all means is that, in many cases, while you are listening and watching your DVDs in 5.1 channel surround sound in your main room, someone else could be listening to a CD (provided you have a separate CD player connected to your receiver) in another room, without having a separate CD player and receiver in the other room - just the speakers. Also, many 7.1 channel home theater receivers offer additional flexibility in setting up and using additional zones. 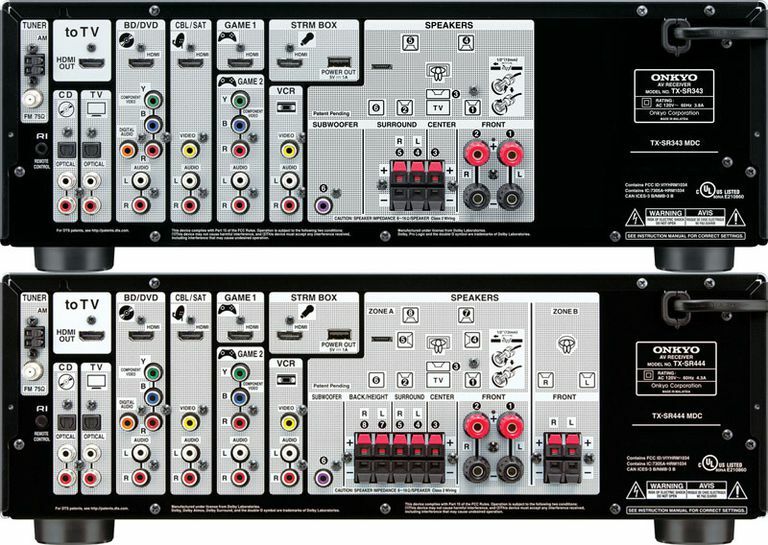 As more sophisticated surround sound processing options become available, such as DTS Neo:X, that can expand the number of channels that can be reproduced or extracted from source content, manufacturers are upping the ante on the number of channels they can cram into a home theater receiver chassis. When moving into the high-end home theater receiver arena, there is an increasing number of receivers that now offer 9.1/9.2 and a small number that even offers 11.1/11/2 channel configuration options. However, just as with 7.1 channel receivers, whether you need 9, or more, channels depends on what you want to accomplish in your home theater setup. Both 9 and 11 channel receivers can be used to set up 9 or 11 speakers (plus one or two subwoofers) in your home theater room. This allows you to take advantage of surround sound processing systems, such as DTS Neo:X. A 9 or 11 channel receiver can also provide flexibility in terms of assigning two of the channels to Bi-Amp the front speakers or use 2 or 4 channels to create 2nd and/or 3rd Zone two-channel systems that can still be powered and controlled by the main receiver. This can still leave you with 5.1 or 7.1 channels to use in your main home theater room. As of 2014, the introduction of Dolby Atmos for home theater has put another twist on channel/speaker configuration options for some home theater receivers. This surround sound format incorporates dedicated vertical channels, resulting in several new speaker configuration options that include: 5.1.2, 5.1.4, 7.1.2, 7.1.4, 9.1.4, and More. The first number is the number of horizontal channels, the second number is the subwoofer, and the third number refers to the number of vertical channels. Another surround sound format available on some high-end home theater receivers, that requires 9.1 or more channels is Auro 3D Audio. At a minimum, this surround sound format requires two layers of speakers. The first layer can be a traditional 5.1 channel layout, but then another layer, positioned above the first layer, requires two front and two rear speakers. Then, to top it off, if possible, one additional speaker that is ceiling mounted above the primary seating area (which is referred to as the Voice of God (VOG) channel. The brings the total number of channels up to 10.1. Also, to make things even more complicated (although it does provide the user with more choices), is the introduction in 2015 of the DTS:X immersive surround sound format (not to be confused with DTS Neo:X), which doesn't require a specific speaker layout, but does provide both horizontal and vertical surround components (it does work well within the same speaker setups used by Dolby Atmos). Keep in mind that the vast majority of DVD, Blu-ray, and any surround sound audio that you will receive from source content is mixed for 5.1 channel playback, with a smaller number of source content mixed for 6.1 or 7.1 channel playback. This means that a 5.1 or 7.1 channel receiver with Dolby/DTS decoding and processing can easily fill the bill (A 5.1 channel receiver can place a 6.1 or 7.1 channel source within a 5.1 channel environment). When moving up to a 9.1 or 11.1 channel receiver, unless it is Dolby Atmos or DTS:X-enabled and your speaker setup with both horizontal and vertically mapped channels and playing Dolby Atmos/DTS:X encoded content, the receiver is actually post-processing the original 5.1, 6.1, or 7.1 channel encoded soundtracks and placing them in a 9 or 11 channel environment The results can be quite impressive, depending on the quality of the source material, but it does not mean that it is required that you make this leap. After all, many don't have the room for all those extra speakers! To put it all into perspective, a good 5.1 channel receiver is a perfectly fine option, especially for a small or average room in most apartments and homes. However, once you get into the $500 range and up, there is an increasing emphasis by manufacturers with 7.1 channel equipped receivers. Additionally, when you get into the $1,300 an up price range you start seeing some 9.1 channel receivers. These receivers can provide very flexible setup options as you expand your system's needs, or have a large home theater room. Don't worry about wires, by the way—you can always hide or disguise them. On the other hand, even if you don't need to use the full 7.1 (or 9.1) channel capability in your home theater setup, these receivers can easily be used in a 5.1 channel system. This frees up the remaining two or four channels on some receivers for Bi-amping use, or to run one or more two-channel stereo 2nd Zone systems.